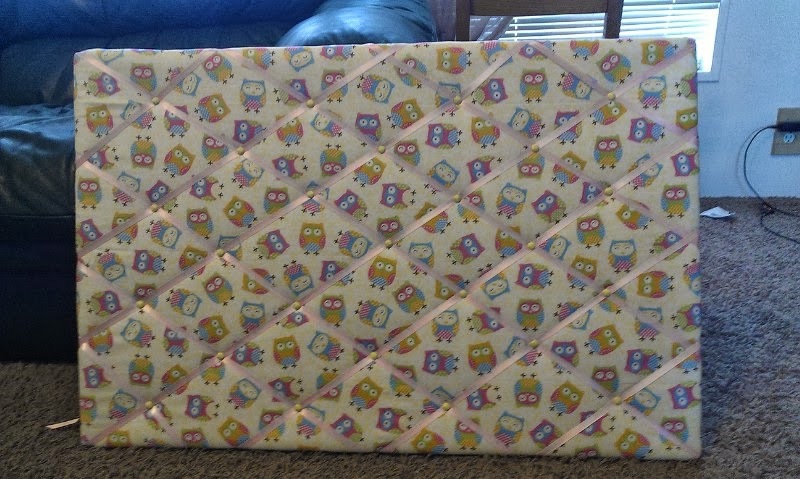 When I bought this fabric, many months ago before I knew I was having a girl, I knew that one day I would have a girl and I needed to make a bulletin board/photo board with it. It was so stinkin' cute. I haven't jumped on the owl bandwagon/craze but these owls were so cute in the remnant bin that I had to take them home. Step 1: lay your batting over your bulletin board. Make sure you have enough to cover the front and wrap around to the back multiple inches. Pull tightly, but not too tightly and staple on the back. Fold corners as needed to keep them looking as nice as possible. Pretend you're wrapping a Christmas present. 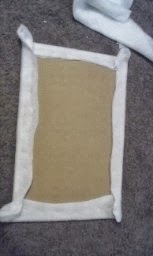 Step 2: Lay your fabric over the batting and position as needed. After stapling one side, pull tight across and staple the other side to the back of the bulletin board. I used 3/8 of an inch staples after discovering the 1/4 inch staples were not long enough. They kept popping out. Continue stapling around, pulling tightly and trying to keep the corners looking nicely. Step 3: The fun part! Ribbon!! I started with the corners that were farthest apart and stapled on the back. If you want to measure how far apart your ribbon is, feel free. I freehanded it and ended up with some rows farther apart than others. Oh well. Step 4: Lay all of the ribbons in the opposite direction, pushing a tack in as it crosses another piece of ribbon. I read on one site that you could use Brads, but that didn't work out. They weren't sharp enough and were too flexible. I also only found tacks in gold and black from Walmart. As a remedy, I bought gold ones because they would be easier to paint over and spray painted them yellow. And that's it!! You have a beautiful fabric covered photo board!! Enjoy!! Next up, I have my adventures in canning and dehydrating as well as some appliqued tie onesies that I am making. As soon as I finish them and mail them off, I will post them and the tutorial I used here! See you soon!! Sew awesome. ;) seriously though, that's awesome that you knew you'd have a girl. I definitely don't have that feeling so I guess it's all boys for me. Or maybe it's just a lack of hope or faith. :) either way, I'm so glad you're having one! She'll have so many cute things in her room. I didn't start making it until we knew we were having a girl. I couldn't imagine myself hauling it around for years under the pretense that one day I would have a girl! Haha. Your package is going in the mail today!